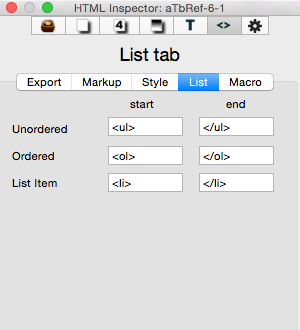 The settings in the List tab control styling of lists in HTML text. Unordered. The before and after fields hold the opening and closing tags for unordered (bulleted) lists and default to <ul> and </ul>. Stored in $HTMLListStart and $HTMLListEnd. Ordered. The before and after fields hold the opening and closing tags for ordered (numbered) lists and default to <ol> and </ol>. Stored in $HTMLOrderedListStart and $HTMLOrderedListEnd. List item. The before and after fields hold the opening and closing tags for an italic passage and default to <li> and </li>. Stored in $HTMLListItemStart and $HTMLListItemEnd.